Placing a single tooth implant can be challenging. To make it easier, Dentsply Sirona Implants offers Atlantis patient-specific made abutments designed and manufactured in a digital environment. How do they work in real life? We asked a patient and a dentist to share their real life experiences with the Atlantis solutions. The story of Peter and his journey to get a new tooth started many years ago. More specifically, at the home of Peter’s grandparents when he was about ten years old. 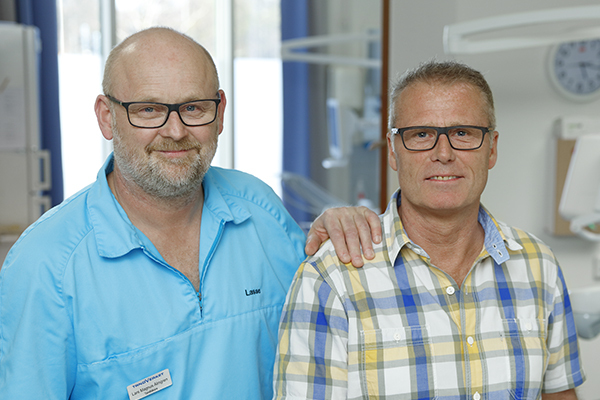 Peter (right) and his dentist, Dr. Lars-Magnus Almgren. Said and done, Peter got in contact with Dr. Lars-Magnus Almgren in Gothenburg, Sweden. When Dr. Almgren examined Peter he saw that the inflammation in the tooth root had spread to the jawbone, causing it to weaken. In order to ensure that the implant was seated sturdily Lars-Magnus used Symbios bone regeneration material for increased ossification on the buccal side of the implant. After healing everything looked good and soon the abutment and crown were fitted. All in all, Peter received a new single tooth consisting of an Atlantis Crown, Atlantis Abutment in zirconia and Astra Tech Implant System. Inspiration & Insights asked Dr. Lars-Magnus Almgren about decision making prior to an implant treatment. Dr. Almgren, what benefits does implant treatment offer when replacing a single tooth, compared with alternative solutions? What are your thought processes when you choose to go with an implant? Click for more information about Atlantis patient-specific solutions.